So what is your ‘theory’ of what makes real change happen? At CFTC, our ‘theory’ is that if we take a long-term approach to development, we can create a sustainable change in the lives of children. And our ‘theory’ is that if we really listen to the local communities we are working with, we are going to find the best solutions. So, we took our CFTC Theory of Change on the road to Haiti and the result was a high-energy workshop with local leaders that ignited passion, creativity and solutions. We have been rolling out CFTC’s Theory of Change (ToC) workshops over the last couple of years. Along with our local partners and other agencies, we are building three-year plans that address a community’s self-identified needs, and that create solutions and opportunities to achieve the clearly-defined goals they agree to deliver. For CFTC, facilitating a ToC workshop never fails to bring out unexpected opportunities, strengths, insights and ideas that simply never would emerge if we took a ‘top-down’ approach. 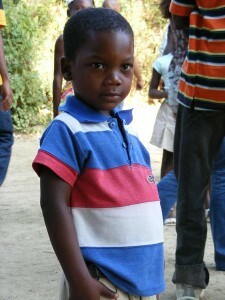 And in Haiti – the ToC workshop was very exciting! Our Director of Programs, Heather Johnston, provides her story below on the first ToC workshop in Haiti that she attended along with our Regional Program Manager – Americas, Genevieve Drouin, and our Country Representative, Madsen Gachette. I hope Heather’s update gives you a flavour for the day, the process and the excitement shared in seeing this next step taken in a country that has the capacity to take a major leap forward in implementing sustainable, long-term change – with a little support from people like us. 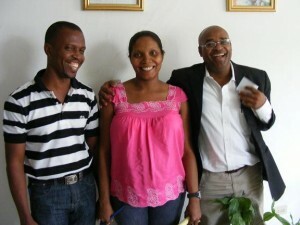 March 18, 2013, Port-au-Prince, Haiti—I never knew that Theory of Change (ToC) could be so much fun! We have just finished our three-day ToC workshop in Port-au-Prince, Haiti, with partners, staff and several external consultants. This is the third workshop I have helped to facilitate while at CFTC – and while normally, Theory of Change can be pretty serious stuff, Haiti is a special place, and this was a special workshop. 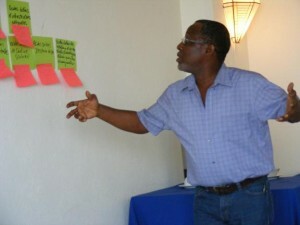 Theory of Change participant, Jean Baptiste Ancelot Venor, leads the group through a “sticky” decision! This gathering started in much the same way that other workshops have, with introductions and a number of presentations to set the context and introduce participants to the Theory of Change approach. However I quickly realized that this workshop would be a bit different from the others. Once participants settled into their new surroundings and warmed up to each other, the jokes started flying and the laughter began. Despite the weightiness of our discussions – trying to take a long term approach to community development under challenging circumstances – my Haitian colleagues approached the debates with humour and creativity. During the group work sessions, tensions from the heated discussions were diffused with a witty comment or a biting one-liner. Disagreements erupted in laughter. Arguments quickly dissipated when a joke was thrown into the mix. As we talked our way through earnest debates on how to fix the education system in Haiti, or how to ensure that all families have enough to eat, I couldn’t help but marvel at my colleagues’ gift of finding humour and joy in the smallest things, and of the ease and fluidity of their human connectedness. No doubt this ability has helped to sustain them through lives that have known many challenges and setbacks, heartbreak and loss. CFTC’s Country Director, Madsen Gachette, certainly has this gift. His laughter is constant; his hope and optimism for his country, his community, his family, contagious. I’m not sure if all the goals and outcomes in our new Theory of Change map for our Haiti program are exactly right. But one thing I am sure of: that despite the many challenges facing Haiti today, this country and its people will succeed. Their laughter and courage will see them through whatever adversity the future holds.